Don Mattrick isn't concerned about the Steam Box, saying that other companies offer "richer" product offerings. 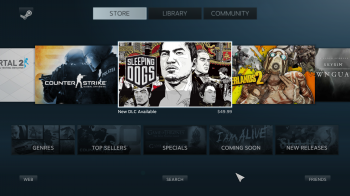 Valve's Steam Box prototypes are set for customer testing in about three to four months, which suggests that the company's initial entry into the console market is drawing near. However, Microsoft's head of Xbox is unfazed despite the buzz surrounding the Linux-based machine, saying that he doesn't consider Valve to be a competitor at this point in time. Don Mattrick, president of Microsoft's Interactive Entertainment Business, addressed Valve's upcoming console at this week's Microsoft TechForum during a discussion about the future strategy for Xbox. Even though he "loves Gabe" and acknowledged that Valve is pursuing some innovative avenues, he stated that Valve is no competition. "The scale of products and things that are being brought to market are probably a little bit richer when I look at Sony, Nintendo, Apple, and Google," he explained. One of Steam's strengths is its considerable product catalog, with plenty of contributions by indie devs. When asked whether Microsoft would fully open the Xbox platform to third-party developers, Mattrick responded: "There's a certain level of technical and production competency that people have to get through because we're trying to curate great experiences. "We're trying to make sure that what exists upon our service on our system is done to a quality level and has interest for people who are likely to use it," he said. Earlier in the year, Newell claimed that Apple was the Steam Box's biggest threat instead, saying that "Apple rolls the console guys really easily" with its stream of market-disrupting devices. Microsoft Studios exec Phil Harrison also spoke out on the Steam Box in January, cautioning Valve that the game hardware market is a tough business, and that any ventures necessitated "great fortitude", "deep pockets and a very strong balance sheet". We'll see if the Steam Box will be able to stake out a place in the living room soon enough.